Rising expenses and a slowdown in new orders in the domestic market hit the widely tracked Nikkei India Services Purchasing Managers’ Index (PMI) in January. This was the second straight month that the services PMI fell. Firms, however, continued to hire, thanks to an accumulation of outstanding business. In January, the PMI stood at 52.2; in December, it was 53.2. The 50-point mark separates expansion from contraction. Growth projections were healthy and rise in expenses was slow for the first month of 2019. New orders grew at their slowest in four months. But, the slowdown was in the domestic market. Orders from abroad rose the most since last September, after back-to-back decline in the last two months of 2018. Growth, however, might soon run out of steam, said the report; at least in the short term. This was indicated by the weakest improvement in demand in four months and relatively subdued optimism. But hiring did not slow down. “Job creation at service providers was among the strongest seen for the past seven-and-a-half years. The increasing willingness of companies to hire workers should help reduce still high levels of unemployment in the country,” said Pollyanna De Lima, principal economist at IHS Markit and author of the report. On the other hand, jobs increased for the 10th straight month in the manufacturing sector, albeit only slightly. According to panel members, growth was underpinned by favourable market conditions. This was also due to outstanding business, which, according to the PMI report, accumulated for the 32 months. Although modest, the rise in backlogs quickened from December. Likewise, unfinished work increased in the goods-producing economy. Industry insiders said the sector is far from shedding the volatility of the past two years. While the services sector has not seen contraction since June last year, growth has remained unstable. Operating expenses continued to climb, with freight, fuel, meat and medicine prices inflating the cost bill. However, firms were hopeful of a reversal soon, with input prices across the private sector rising at the second-weakest pace since last April. On the other hand, prices charged for the provision of services in India rose again in the new year, as firms sought to share an additional cost burden with their clients. Despite being the highest in three months, the rate of output-price inflation was marginal. Factory gate charges, meanwhile, changed little. Business sentiment among firms, however, was optimistic regarding advertising efforts, new service offerings, and predictions of an improvement in market conditions after the elections, slated later this year. Optimism faded to the weakest since last October. Some panellists mentioned that although they expect output levels to be higher in 2019, improvements are anticipated to take place after the general elections. Manufacturers, on the other hand, were at their most upbeat in four months. The increase in factory orders for good-producing firms was the strongest seen in 13 months. Subsequently, production volumes were boosted at the start of 2019 and the rate of expansion was the sharpest since December 2017. 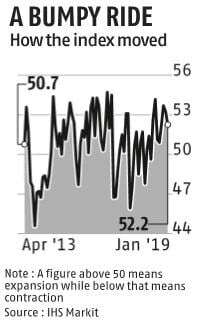 The Nikkei India Composite PMI Output Index, which maps both the manufacturing and services sectors, remained unchanged at 53.6 in January from December. This was down from a 25-month high of 54.5 in November.